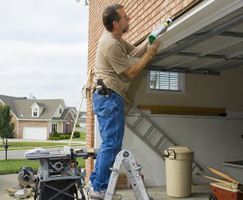 There are many kinds of garage door repair services you can avail of. You may even be surprised that some services that are already offered by companies as a typical service. Garage door repairs, obviously, are common. You would most likely be calling a garage door company for repairs or troubleshooting. The repairs are not only limited to the doors or parts of it like the hinges, tracks, panels, or springs. Most repair services also include the repair of door openers or operators. On the other hand, there are companies that also offer adjustments and modifications especially for the replacement of door panels and the addition of insulation. Moreover, you may be surprised to find out that door maintenance is also something offered by companies. You would likely think that maintenance is something that is typically done on a DIY basis but you can actually ask for the experts to do it for your convenience and to have it done properly. We at “Garage Door Repair Rowlett” guarantee excellent repair solutions to address all types of door problems and needs, such as broken garage door cable repair. You can be sure that we can effectively and efficiently restore or replace your snapped cables, damaged panels, broken springs, defective hinges, and various other problems in different parts of your door. We can also bring back your malfunctioning door opener to its good state regardless of the type of defect unless a garage door repair no longer suffices or when replacement is already necessary. The expertise and experience of Garage Door Repair Rowlett in handling all kinds of problems or defects are easily proven by the company’s track record. You can easily obtain good feedback from the many satisfied customers, for both commercial and residential garage door services, we have served over the years. Dial our number to know more about the range of services we offer. You can schedule a repair job order through telephone or by sending us an email.